Can you provide an audience? We can provide the show! of their imagination to the point that it becomes their complete reality. Does your group need to raise money? We can definitely help you reach your goal! how much would they raise? More people, more tickets sold, more money for you. Minimum audience 100 people - Hypnosis Stage Show time approximately 1.5 hours. "Best show ever! So entertaining and funny. Highly recommended. Cant wait till the next hilarious night of entertainment." "Thank you so much for such an entertaining night of fun and laughs. We have had so much positive feedback, everyone really enjoyed the show. We will definitely be booking you again and recommending you to others." "Thank you very much for coming down to host our event for the Netball and Rugby Club. Those that attended said it was the most they have laughed in ages." "Thank you so much for being part of our event. You wouldn't believe all the positive comments i've had back with regards to your show - just amazing!" "Everyone had a great time. It was a very entertaining evening with a great deal of laughter medicine which we can all do with. Many who were reluctant at first to come said they would recommend it to others to go and would go to another in the future." "Thankyou sooo much for coming down Saturday night. There has been plenty of extremely positive feedback from your show and I get the feeling you might have a few groups contacting you toward the end of the year. Was an awesome night, people are still laughing about it, and again thankyou so much." "I arranged for Ian Blaine to do a hypnosis show for a fundraiser for Papakura Rugby. Ian is a really lovely approachable guy who went the extra mile to make our show a huge success. I have had strangers stop me in the street to tell me what a great night it was. It was one of the easiest fundraisers we have done, and believe me we have done a lot! Heaps of fun, easy and made great money for our boys Aussie Rugby trip. We made way over what we estimated in fundraising. Would highly recommend Ian to everyone wanting a fun filled night." "It is with great pleasure I would sincerely like to thank you and your business for kindly supporting our Red Faces 2009 event held at "The Meteor" in Hamilton on Saturday the 18th July 2009. The event raised over $10,500 towards patient amenities for the residents where I work as a Nurse and it will certainly be a great way to improve their quality of life within the Rest Home and Hospital wings. The monies raised were with your kind support and I would like to extend on behalf of all Residents at Rossendale Dementia Care Home & Hospital our greatest appreciation." "I would like to thank you for the fantastic night on Saturday!! Everyone loved my 21st and so did I. I honestly don't think it could have gone any better. Everyone has and still is raving about it, and some people have even contacted me to get your details so hopefully you get some additional business from the night. I can't thank you enough for making the night such a success, it will be a 21st that won't be forgotten anytime soon." 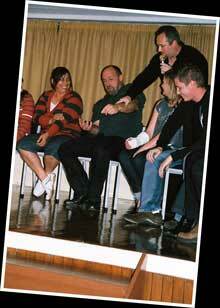 "Thankyou very much for donating your time at the Hypnotic Show fundraiser for Muscular Dystrophy Northern. We have raised over $2,500 and so are thrilled with this result. It would be great to have this as an annual event in our fundraising calendar." "A Big Thanks to you for coming north and supporting our School and Community with a great Show. It was full of laughs and we have lots of people talking about it today, and I'm sure they won't stop talking for a few weeks yet."